In my ideal home I am surrounded by abundant produce: groaning fruit trees, deep crimson tomatoes, bees humming in herbs, my children wandering into the garden picking and eating things grown organically and us all happy together. Kind of like a French potager garden, with interesting and delectable produce, always tidy yet rambling enough to hint at mystery. Friends coming over for BBQs and outdoors cooking and lounging around in the natural beauty. Instead my backyard is growing weeds. Lots of weeds. Before I knew it, it was summer. And then we had a dry heat spell for weeks. It was impossible to plant anything: seedlings withered almost as soon as they hit the soil. Yeah, crazy negative self talk. Intrigued, I delved further. 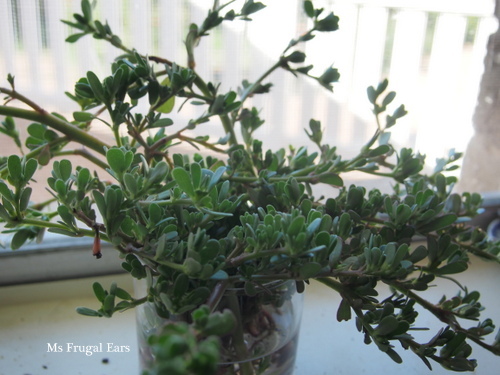 Portulaca Oleracea, I discovered, is more commonly known as purslane, or verdolaga. It is a summer plant, a native of southern India, and is also native to Australia as well (even though it is usually regarded as a weed.) It is grown and sold as a vegetable crop in many countries. There are even posts of people begging to find seeds to grow it themselves, or wanting to know how to find it at farmers markets. It is used widely in southern Indian cuisine, and also Turkish cuisine. And it is pretty special. How special? Well, it has one of the highest concentrations of omega 3 fatty acids of any land plant – in fact it has more than some fish oil. Celebrity Dr Oz even appeared on Oprah and touted purslane as one of the supreme anti-aging superfoods. And it is FREE. Growing in my backyard, organically, without me having to water it or spray it with pesticides or insecticides. It tastes pretty yummy as well. I like it better than spinach. I used it in my recipe for red lentil stew. 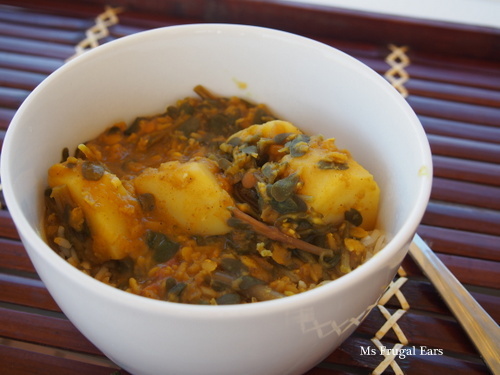 It is kind of like a dahl, but not really an authentic one. I love curries but don’t profess to fully understand the nuances and intricacies of Indian food. For this, I just threw together what I liked and what was in my spices drawer. I liked the combination; and I actually really like Keen’s curry powder. This casserole will make a massive amount, enough to feed six hungry people with leftovers. If you are having a tough back-to-school and faces the bills week, this is a recipe that could tide you over for several meals. Fry the garlic and the ginger in the oil slightly, then add in one chopped tomato. Cook until the tomato has softened, then add the spices (except the chilli). 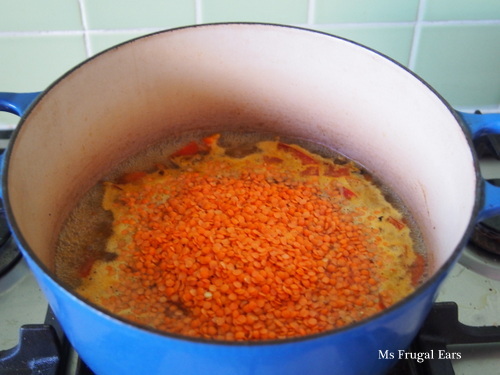 Stir in the red lentils and allow to coat in the spices and oil, then pour in six cups of water. Bring to the boil. Peel and cut the potatoes into chunks. Salt to taste and cook until the potatoes are nearly done. 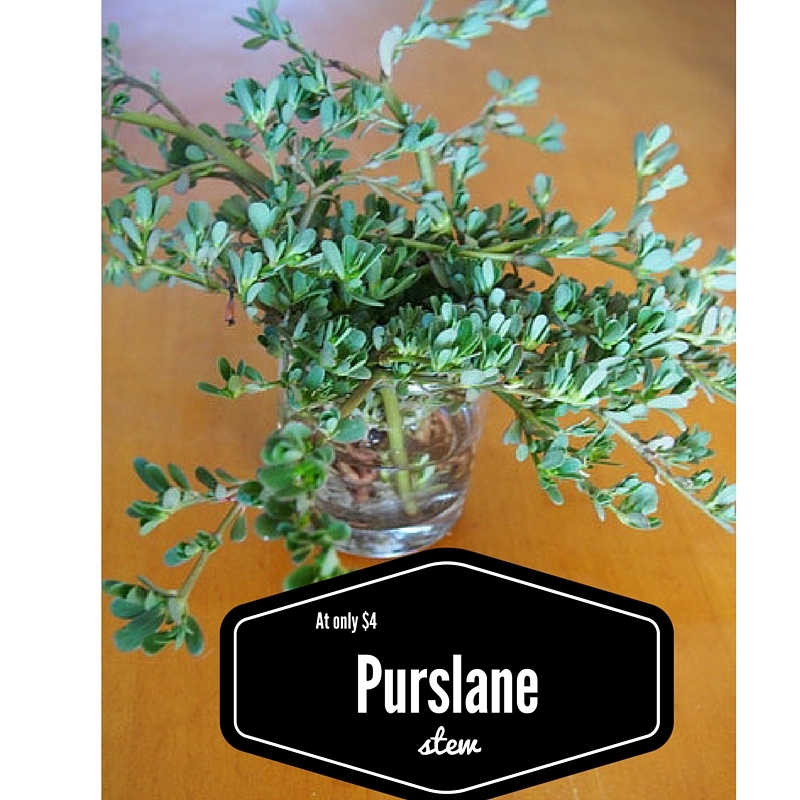 Pick the purslane into small pices, around 1cm. Use the whole plant, including leaves and stems. 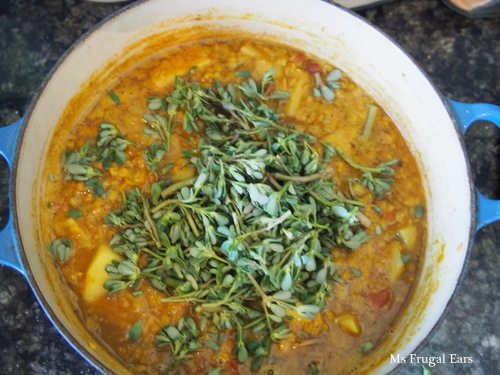 Add to the red lentils and cook for five to ten minutes or until the potato is done. Serve hot over basmatic rice. Ha ha, I didnt know what purslane was a week ago, either, and it has been growing in my backyard for years. Thank you for the lovely compliment. 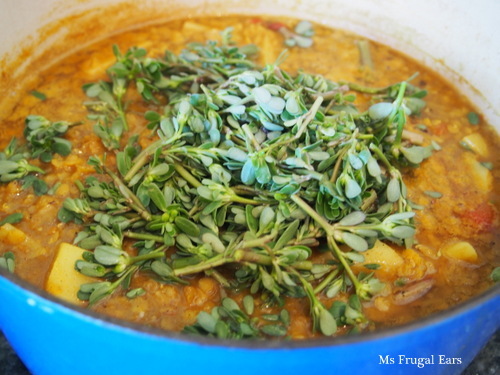 Lentils always make healthy and hardy stew, and how cool to find out a weed is food and in free supply! Wow! An economical yet nutritious, full of flavor stew. Thanks:) Actually I’m still learning and not a real expert (yet). There is a lot of abundance if you know where to look. What a great story. Nice to have discovered the treasures growing in your own back yard! Very informational post..love it!! Thank you. Treasures come in the most unexpected places and often when you least expect. Looks yummy! I’ll be giving this a go when the weather starts to cool down. Hi there, maybe you have purslane and don’t realise it. I am discovering that I have a profusion of treasures hidden in the rambling growth. Looks like a dish Joseph would love! You are very kind. I cannot profess to have any special understanding of Indian cuisine. My Pakistani neighbours had some tonight and they said that with different spices it would taste like a dish from Pakistan – so perhaps I am almost there? Purslane is delicious. I am sure if you used your spices you would create an amazing version. hmmmm looks interesting. I think I would have to try it before i made it.